Terryl Ryan is a 1978 Honours graduate of Canadore College, Crafts & Design. She also attended Sheridan School of Crafts & Design, Introductory to Craft, and Seneca College Visual Arts Instructor Training. In order to broaden her knowledge and keep up to date on the latest techniques she continues to take workshops whenever possible. The Shakers, a well-known group in the USA, have had a major influence on Terryl’s work. She admires the Shaker commitment to making well-designed, functional objects that are also beautiful. She loves to incorporate recycled and rescued fabrics in her weaving and quilt making, concentrating on the use of colour to bring life and liveliness to her work. Rugs, table linens, scarves, blankets and wall quilts are some of her favourite items to make, and she has been making soap from scratch since 1980. 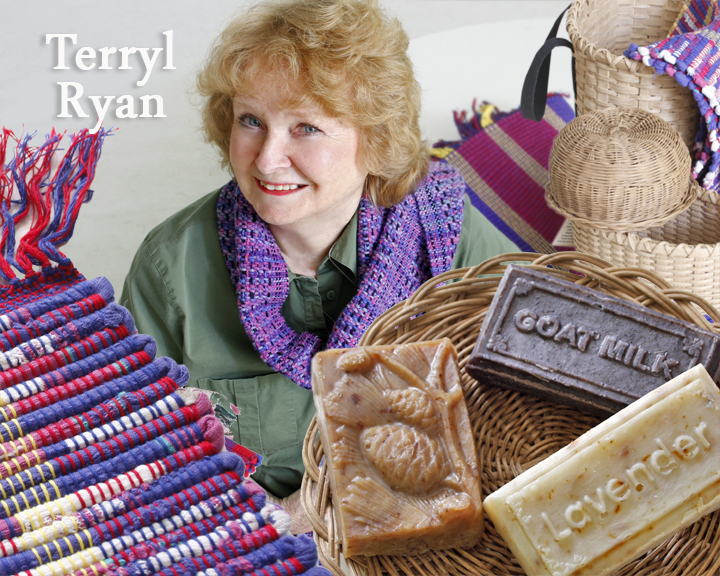 For her baskets, Terryl has adapted many of the traditional Shaker styles for today’s uses. While the object being stored may change, the usefulness of the basket does not. When available, she incorporates natural materials into her baskets, and finishes them with a stain she makes from walnut husks. Terryl greatly enjoys teaching and passing on the knowledge she has acquired. She has been teaching at College and community level since graduation and offers beginner basketry, weaving, and quilting workshops in the community as well as in her home studio.